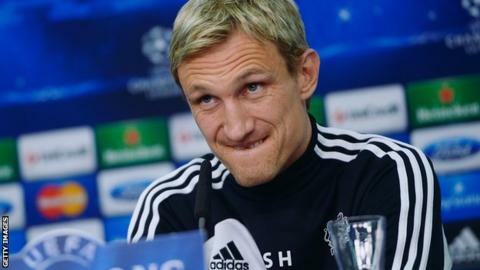 Bayer Leverkusen have sacked head coach Sami Hyypia after a run of just one win in their past 12 matches. The 40-year-old ex-Liverpool defender took sole charge at the start of the season, having previously shared the job with Sascha Lewandowski. Lewandowski, 42, who was working with the Bundesliga club's youth teams, steps in for the rest of the season. Leverkusen lost 2-1 to Hamburg on Friday, putting their Champions League qualification hopes in jeopardy. They remain fourth in the table but Wolfsburg, Borussia Monchengladbach and Mainz are within four points of them - and all have a game in hand. "The dramatic developments of recent weeks gave ​​us no other choice," sporting director Rudi Voller, a former Germany international, told the club's website. Having joined Leverkusen as a player in 2009 before retiring two years later, Hyypia was appointed to the club's coaching staff - alongside Lewandowski - in April 2012. The duo led the side to Champions League qualification last season and, despite a 5-0 home defeat by Manchester United, they reached the last 16, losing 6-1 on aggregate to Paris-St Germain. Hyypia, who won 105 caps for Finland, was a Champions League winner at Liverpool in 2005, and was also part of the team who secured a historic FA Cup, League Cup and Uefa Cup treble in 2001. An unheralded £2.5m signing from Dutch side Willem II in 1999, he made 464 appearances in a decade at Anfield, and won seven player of the year awards in his homeland between 1999 and 2008.